Monica McFawn won the 2014 Flannery O’Connor Award for Short Fiction (along with Karin Lin-Greenberg, whose book I reviewed recently). 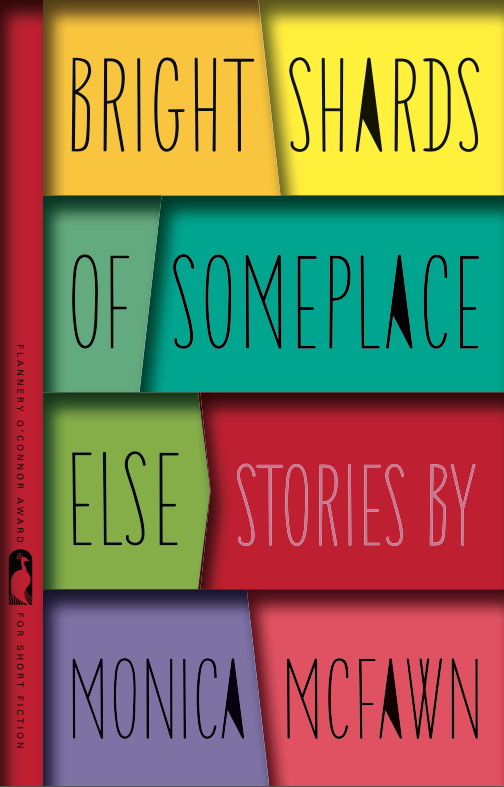 Her debut short story collection, Bright Shards of Someplace Else, was published by University of Georgia Press on September 15 to enthusiastic reviews from the likes of NPR, Booklist, and Publisher’s Weekly. 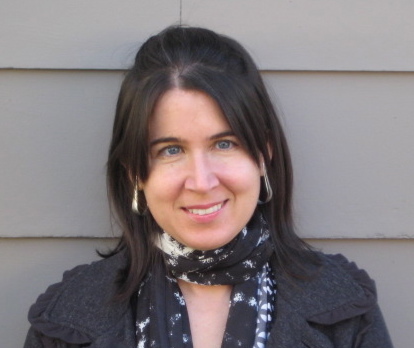 McFawn’s fiction has appeared in the Georgia Review, Gettysburg Review,Web Conjunctions, Missouri Review and other publications. She teaches writing at Grand Valley State University outside Grand Rapids, Michigan. My review of Bright Shards of Someplace Else is forthcoming. I’ve heard this for years. I might be sitting with a group of acquaintances, empty wine bottles and plates on the table. I might be in a car with a friend, talking to pass the time. I might be at work, at night, regaling a coworker with a story that extends past the hour when we both should be getting in our cars and heading home. It’s a compliment, I know, so I always smile while simultaneously shaking my head. Despite the fact that I’m a writer, the majority of stories I’ve told won’t be committed to paper. It isn’t because I think the stories aren’t good enough. In fact, some of the stories I tell are polished to a sheen, any crude transitions or slow spots worn away by years of telling, of watching listeners’ faces. Still, I believe the fact that I don’t write them down has paradoxically helped me become a better writer. Long before I had the notion to be a writer, I was a storyteller. I grew up in a household where both my parents told stories, and monologues, rather than dialogues, were the primary form of interaction. As I kid, I was bullied because of my crossed eye (“maybe if we hit her in the back of the head we can knock it straight” was one memorable taunt) but I believed that I was being mistreated simply because they didn’t really know me. The problem was, as I saw it, that they had never heard me tell a story. As I walked through the halls, I practiced stories I might tell, stories that would make it clear that I was far too self-aware, ironic, and subversive to ever be the target of a bully. A story, I thought, was a perfect, round package of my selfhood, far better than one side of a conversation, which was so easy to misconstrue. I still see stories as a shortcut to understanding, a better method for learning about someone than the shapeless one-offs that back-and-forth conversations demand. Why not just tell a story, and hear a story back? At any one moment, I have two or three stories in heavy rotation for just this purpose, with a few others that are semi-retired, though the right circumstance will bring them bubbling forth. One of my favorite stories dates from 2008, and I’ve been worried, as I’ve gotten older, that perhaps 2008 marked the last time my life was colorful enough to produce a story. I’ve known adults who’ve only told stories from their youth, as if they only persisted into adulthood to serve as a living record of their glory days. But fortunately, 2013 was a good year for stories, so I have a few fresh ones to trot out. People find these stories amusing, shocking, or strange, but no matter how strong the reaction, I never commit them to paper. One of the main reasons is that I don’t want to lock a story down in one form. Even the phrase “write it down,” seems to imply that the stories must be dragged down from the ether and pinned to the page. The stories, in their mutable, airy form, maintain their dynamism. I never know, exactly, how I will tell that same story to any given audience. There are short versions of each story and long, minutely detailed versions. There are versions that emphasize my bumblings and those that emphasize my cunning. Each time I tell a story, I refine the delivery and tighten the structure. The story—what actually happens—is the only thing that doesn’t change. But by telling the same story over and over, I’m able to see the myriad possibilities in any story, the way the plot dictates so little of what the story actually is. As a fiction writer, this has been a useful lesson, since the “idea” of a story is so secondary to the tone and richness with which it is told. Whenever I tell a story, I launch into it with great enthusiasm, even though I’ve told it before. I’m an old magician who has somehow retained the ability to be dazzled by my own tricks. I have to be dazzled, or I won’t tell the story well. I can’t fake it, so somehow, as I’m telling it, I have to tap into whatever was compelling, strange, or moving about the original experience, no matter how long ago that was. This ability to draw from the same well over and over has been one of the most useful things for my writing. Often, when I’m beginning a short story, I’m exhilarated by my concept and ideas. But after weeks or months of struggling with the writing, I begin to doubt my idea, and the whole story seems stale, dry, and not worth telling. At that moment, I imagine that this story—the one I’m writing—is the only one I’m able to tell, and someone is waiting for me to tell it—someone I need to charm. I force myself to find the place where it still sparkles, and I begin writing again with new courage. After all this talk about stories, I think I need to tell one, one that I never planned on writing down. It’s short and seemingly insubstantial, but it has stayed with me for years. It goes like this: I’m an undergraduate student, taking an Anthropology class in a large lecture hall. I flopped down in my seat one day to see the professor is different from normal. Rather than a woman with crimped blond hair, it’s a shorter, dark haired professor. A sub, I figured. The lecture was already in full swing when I entered class, and I found myself struggling to make sense of it. The woman kept going on about rocks. Sediment this, limestone that, what was the point of this? Probably these rocks were made into spearheads for some tribe or something. I let my mind drift, as it often did, until it was time for break. The professor was handing back tests during this time, and everyone got their test back but me. I marched up to the professor and demanded my test. She asked my name and scanned the roster. “You’re not on my roster,” she said. “Well, I’m in this class alright. So someone made a mistake.” I leave her to fix it, mumbling to myself as I sat back down. Sheesh, what a disorganized sub. The professor resumed her lecture, still talking about damn rocks. I looked up at the clock, hoping we’d be let out soon. I felt a sudden vertigo. The clock was on the wrong wall! Normally it was on the right, now it was on the left. In a flash, it occurred to me that I might be in the wrong class. I turned to the student next me and asked if this was Anthropology 105. “This is Geology 305,” the student responded, side-eyeing me with haughty disgust. The different professor, the lack of being on the roster, the subject matter—none of this had tipped me off. After over an hour in the wrong class, only the clock struck me as wrong. Why do I tell this story? I think its because I love all the ways I rationalized what was different, how I tried to make the rock-loving brown-haired professor fold into my scheme of normality. There was something strenuous about my justifications, yet at the same time I was too lazy and inattentive to see the obvious. I also love the point in the story where I turn to the student next to me. At that moment, when I saw the clock on the wrong side, my whole sense of reality tipped. My familiar Anthropology class had become someplace foreign and strange, and when I turned and asked the student what class I was in, I was also sharing what felt to me like a shocking epiphany. But the student was bored, blasé, annoyed—I was just some confused underclassman. That disconnect between what I was feeling and how it was received seemed to me both hilarious and profound: isn’t that how it always is? Many of the characters in my fiction experience this same disconnect of perception, so perhaps it was a good thing that I told this story so many times, turning over that same absurd, poignant moment again and again. Now that I’ve written it down, though, I will have to find a new moment like this in my life, something sparkling, like a piece of quartz, I can carry with me and share.